11" x17" Newer print by older artist. This painting is hand painted on rice paper. High Resolution Art Print On Real Canvas. Material: 100% Real Premium Quality Canvas. What to expect from SaltLakeCo canvas prints - YouTube. Paste link into a browser window:[isdntekvideo]. Video will open in a new window. Abraham Palatnik. Abraham Palatnik [ b 1928 - ] Internationally renowned and well respected Brazilian artist designer. Lucite Acrylic Goose Duck. 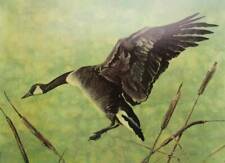 Subject matter features a seated goose bird with black graphic design. The bird is detachable for storage. Artist drawn inked margins. The front of the artwork was covered in plastic which is still intact. Looks excellent. Wonderful art at affordable prices! Orchard Orioles Bird Vintage Botanical Art Print 9 1/8" X 11"
Orchard Orioles Male Female Juvenal plumage shown nesting in a native tree. 1979-80 Federal Duck Stamp Print "Green-Winged Teal" with signed stamp. The artist signed stamp as shown is included. 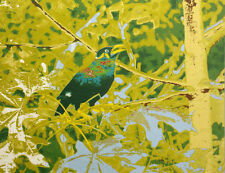 This Green-Winged Teal print is numbered 5967 out of of 7000. Very hard gem. (I tried to scratch the bottom of the sculpture with the tip of a knife, but, it made no mark.). Ikki Matsumoto is a world renowned artist that lived in SW Florida. He has been capturing the beautiful Florida birds since 1975. His most famous work can be found in the 1975 Edition of "The Joy of Cooking". John Robert Mason. born in North Carolina ,lived in Suffolk, VA. He used colored pencils and felt markers on paper or cardboard. His pictures are of stylized birds, moons, trees and suns. His "studio" was the Hardee's restaurant in Suffolk. Jeffery R. Day "Great Blues Marsh" Print ~ Signed 9/500. 11.5 X 16.5"
Great Blues Marsh. Number 9 of 500. William J Watson Green Stained Driftwood Shorebird Carving Sculpture Signed 9.5"
Carved driftwood shorebird sculpture by Orlando artist, William J Watson. The graceful bird is stained green, with the lovely grain of the wood adding to the design. The shorebird’s beak is painted gold. In 1966 he joined the Centre d'Art. Gérard Valcin and Préfète Duffaut were his teachers under whose guidance he developed his own style. Pierre Joseph-Valcin's work consists mainly of scenes from country life; birds perched on blossom-covered trees, and voodoo scenes. Beautiful image! Mattes are a "light gray" and a "dark red/orange" -- a beautiful combination! About the artist G. Clark Sealy (Hawaii, Born: 1955): A contemporary Hawaiian etcher and aquatint engraver, G. Clark Sealy studied art in Honolulu and began exhibiting his work in Hawaii, California, Oregon and elsewhere during the 1980's. By Joni Van Kley. Joni Van Kley, a local, Central Florida Artist is well recognized for her impressionist watercolors of Florida birds and marine life. The painting depicts a pair of giant white storks in their natural habitat. New ListingArtwork, Wood Framed w/Glass, Owl Print - 6.5" x 8.5" - Green, FREE SHIP! It is signed by Jo Brien and in great condition. Description: From; 'Reizen en onderzoekingen der Sumatra-Expeditie, uitgerust door het (Aardrijkskundig) Genootschap', published in The Netherlands c. 1875. Artists and Engravers: Made by 'J. G. Keulemans' after an anonymous artist. Johannes Gerardus Keulemans (1842 - 1912) was a Dutch bird illustrator. For most of his life he lived and worked in England, illustrating a large number of the best-known ornithology books of the nineteenth century. Audrey Grendahl Kuhn original signed intaglio etching "Family of Loons" 19x28"
Artist: Audrey Grendahl Kuhn. Title: "Family of Loons" written in pencil at lower left. An outstanding etching with deep embossing throughout and a favorite subject of artists -- the common loon or great northern diver. The colors of this engraved print are vibrant, detailed, and breathtakingly beautiful. I inherited this beautiful engraving from my father. Description: This plate originates from: 'Ornithologia Neerlandica, de vogels van Nederland' by E. D. van Oort, which was printed from 1922-35 The collotypes are after the M.A. Koekkoek. It was perhaps the finest ornithology book made in that period. Later the plates were licenced to H.F. Witherby, who partly re-used them in a smaller format in 'The Handbook of British Birds' (1938-1941). Artists and Engravers: Made by 'Eduard Daniel van Oort' after an anonymous artist. Eduard Daniel van Oort (1876-1933) was a professional ornithologist in charge of the rich collections of the Rijksmuseum of Natural History in Leiden. He authored the 'Ornithologia Neerlandica' (1922-1935). Proceeds from these art programs directly benefit wildlife habitat throughout the country. 2010 - Ducks Unlimited National Duck Stamp. 2009 - Ducks Unlimited International Artist of the Year. Together, they hiked the many trails around Central Oregon gathering reference and studying the abundant wildlife. The earth tones in this piece create a relaxing mood and generates calmness and serenity within the viewer. Baterbys Art Gallery. Where Art is Passion. About Baterbys Art Gallery. Variety, quality and authenticity are what you will find at Baterbys Art Gallery. 'Harvester of Green Grapes'. A bird alights on the head of a beautiful woman, wrapping its feathers across her like a turban. Jacira Baptista's imagination takes flight to a world of dreams. 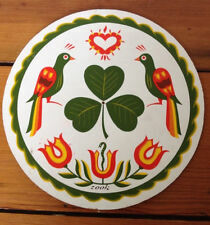 More NOVICA Treasures. 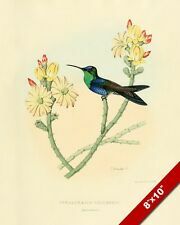 Description: This antique print originates from: "Nederlandsche Vogelen", Amsterdam, 1770-1829 by C. Nozeman, M. Houttuyn and J.C. Sepp, At this point we still carry most of the plates from this famous and exceedingly rare work, which ranks among Audubon and Barraband as the most beautiful bird prints ever created. Most birds are engraved close to life-size. Each plate comes with the corresponding original text page(s). Please inquire if you are looking for a specific species not exhibited in our ebay shop or website. Artists and Engravers: This monumental work is associated with Christiaan Andreas Sepp, Jan Christiaan Sepp, Jan Sepp, Cornelis Nozeman, Martinus Houttuyn and Coenraad Jacob Temminck. 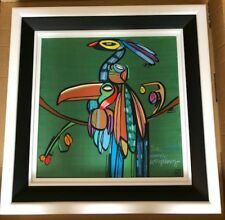 Nam Fung "Blue Bird" Chinese Art Oil Painting on Cork Paper Framed 18" x 22"
Beautiful Oil Painting on Cork Paper Artist: Nam Fung "Blue Bird" Framed in a velvet and brown wood frame behind glass Framed measurements are 18" x 22" Unframed measurements are approx. 12" x 16" Condition: Art is in great condition with natural flaws from cork paper composition. The frame has minor signs of wear and the top left corner is damaged (missing part of the ornate decoration). Please see pictures showing item details and condition., . In excellent used condition, unable to read to signature of artist. Would look great in a beach themed room. Plexiglass has a dull area in last photo. 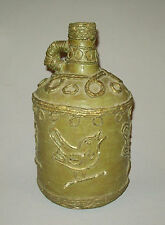 It is one of Florence Kohls earliest pieces. Alex is an artist based in Bangkok, Thailand. New.Recycled Sculpture by Alex. These pieces help save earth's valuable raw materials and need less high-energy production processes to make. : as shown in the pictures. Stated on print J. Gould No. 607. Lithograph is in very good condition. Beautiful print by the late Jerry Nelson Haynes, a Louisiana artist that was very well known throughout the South. Description: From 'Dictionnaire des sciences naturelles : Planches. 2e partie : regne organise Zoologie, Ornithologie.' by Dumont de Sainte-Croix, published in Paris by F. G. Levrault 1816 - 1830. Artists and Engravers: Made by 'Rebel' after 'Jean-Gabriel Pretre'. Jean-Gabriel Pretre (20 December 1768 – 29 April 1849) was a Swiss-French natural history painter who illustrated birds, mammals and reptiles in a large number of books. Several species of animal were named after him. Description: From 'Dictionnaire des sciences naturelles : Planches. 2e partie : regne organise Zoologie, Ornithologie.' by Dumont de Sainte-Croix, published in Paris by F. G. Levrault 1816 - 1830. Artists and Engravers: Made by 'Giraud' after 'Jean-Gabriel Pretre'. Jean-Gabriel Pretre (20 December 1768 – 29 April 1849) was a Swiss-French natural history painter who illustrated birds, mammals and reptiles in a large number of books. Several species of animal were named after him. By Rick Brogan. His work is included in many collections, including the Xcel Energy collection. He is known or his western landscapes. His art been published in Southwest Art, Artists Of The Rockies And Golden West and Santa Fe Magazine. Description: From 'Dictionnaire des sciences naturelles : Planches. 2e partie : regne organise Zoologie, Ornithologie.' by Dumont de Sainte-Croix, published in Paris by F. G. Levrault 1816 - 1830. Artists and Engravers: Made by 'Massard' after 'Jean-Gabriel Pretre'. Jean-Gabriel Pretre (20 December 1768 – 29 April 1849) was a Swiss-French natural history painter who illustrated birds, mammals and reptiles in a large number of books. Several species of animal were named after him. Painting: 26 x 51" (66 x 130cm). This is a scroll which you can hang on the wall as it is. It is hand painted on rice paper with silk mounting. Original Watercolor by An-Li Han. " Rooster". An-Li Han is an artist out of China, her dad was the right hand man for Shang-Hi Sek. Hand signed by the artist. Image Size: 28.5" x 17". Description: This attractive original old antique print / plate originates from: 'Svenska Foglar Efter Naturen Och Pa Stenritade' by Magnus von Wright, published in 1917-1929, printed by A. Bortzells, Stockholm. (The first edition appeared between 1828 and 1837). The lithography on these plates is exquiste and very difficult to distinguish from hand-painting. Artists and Engravers: Magnus von Wright (1805 - 68) was the first taxidermist working with the vertebrate collections of Helsinki University. Starting out as a taxidermist in the 1820's, he stuffed birds for Societas pro Flora et Fauna Fennica, the oldest scientific society in Finland, and in 1845, became taxidermist at the university's zoological museum. (The paper on the back says Aster and Bluebird by Gesso. Artist: Gesso Yoshimoto 1881-1936. Date of Printing: 1930's. Signed and numbered prints, Japanese and Chinese Panels & Screens). Reproduction: No.